Home > Featured Post > Support the Issa Trust Foundation using AmazonSmile! 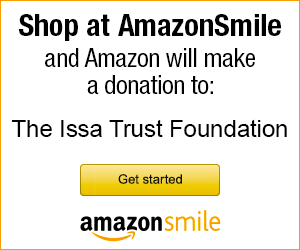 Support the Issa Trust Foundation using AmazonSmile! You Win Along With The Children – Set It and Forget It! AmazonSmile donates a portion of your purchase to the charity of your choosing. Choose the Issa Trust Foundation as your charity of choice, and Amazon will donate 0.5 percent of the price of eligible purchases to support Issa Trust Foundation programs. AmazonSmile is a simple and automatic way for you to support the Issa Trust Foundation every time you shop, at no cost to you. When you shop at smile.amazon.com, you’ll find the exact same low prices, vast selection and convenient shopping experience as Amazon.com, with the added bonus that Amazon will donate a portion of the purchase price to our foundation! Click on the link below to begin using AmazonSmile in support of The Issa Trust Foundation! We truly believe that if we want to change our world and really make a difference, there is no better place to start than in the life of a child! Today’s children are our future—they are the ones who will be leading their countries and cities . . . the ones who will be shaping the values future generations will live by. And though they may just be small children now, they still hold a great purpose. You shop, Amazon gives directly to The Issa Trust Foundation, helping us continue our mission — making a difference for children, one child at a time!